Hi, I am interested in your 1979 Ford Bronco (stock #4713-ATL) listed on Autotrader for $24,995. I'd like to get more information about this vehicle and confirm its availability. Such a great looking, rugged SUV and with a nice bright color and period correct from front to back to boot! 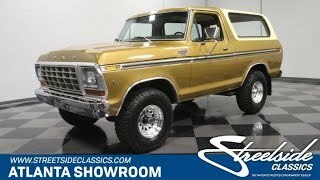 You dont come across all that many Broncos from its era and this 1979 Ford Bronco Ranger XLT 4x4 is a great representative of the model in its husky late 70s form. Its running very strong and is ready for action on both the highway and rougher terrain just as soon as you get it home. A well-planned restoration has left this classic looking very sharp after its 40 years of service. Even as it rolled off the assembly line, it looked like it was capable of handling nearly anything sent its way, with its broad track and appreciable ground clearance. The Medium Gold Sand metallic shade draped over its exterior is a period-correct update - the color was one of the options the year this 79 came out and it definitely looks the part, making a positive impression right away with its strong shine and uniformly smooth texture. This is a very vital-looking ride in all respects - its array of trim is still looking strong and really pops nicely against its gold background and both the front and back bumpers appear to have been recently replaced. The contrasting half cab hard top is removable - equipping this vintage Ford with an entirely different look and a semi-convertible experience when its not in place. The tan interior remains in its original configuration and, while you can see some signs of wear in a couple of places - namely, the center console - everything is looking pretty sharp inside these doors. The bucket seats are still fresh and sport well-fitted covers, the door panels show no signs of sagging and the carpet below was likely replaced not long ago. Just beyond the factory-issue steering wheel sits a dash area that is in unusually clean shape: the collection of gauges in its instrument cluster are nice and clear and even the woodgrain accent surrounding it - often the first spot to succumb to age and sun exposure - looks pretty fresh. An aftermarket AM/FM/CD stereo sits in place of the original to fill the cabin with sound and the in-dash vents stand ready to cool or warm the cabin as needed, although the air conditioning system itself will need some attention, as its plumbed but theres currently no belt driving its compressor. The storage area behind the back seat is in good order and with the liftgate in its lowered position you can see that its looking clean as well. This venerable SUV is powered by a 351 Cleveland, no doubt one of the most coveted powerplants Ford has built over the years. Armed with an Edelbrock 4-barrel carb and exhaling into a pair of short tube headers, the engine is running very strong, firing up promptly with a turn of the key, pulling with plenty of power and combining with the Broncos ample ground clearance to make it a force to be reckoned with on rugged terrain. The 3-speed automatic transmission shifts with slip free precision and the lever unleashing 4-wheel drive sits within easy reach of the driver. Power steering makes for easy navigation, while power brakes that feature discs up front bring the set of 15 Ion alloy wheels outfitted with beefy BF Goodrich All-Terrain tires to dependable stops. Below, the undercarriage looks well-positioned for plenty more service. This 1979 Ford Bronco Ranger XLT 4x4 offers the chance to get behind the wheel of a seldom seen SUV thats both thoroughly vintage and eminently capable. Call today!